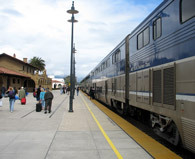 The Santa Barbara Station has received uninterrupted passenger train service since the creation of Amtrak but this was only from the daily (and triweekly for a few very early years in the 1970s) Coast Starlight (supplemented by the state sponsered overnight 'Spirit of California' from 1981 to 1983). 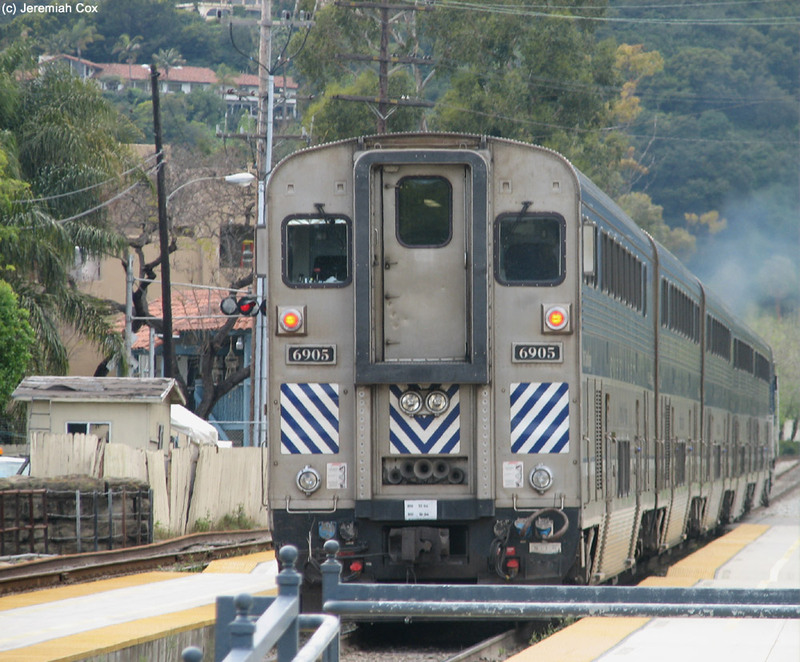 It took until June 26, 1988 for a San Diegan train (now renamed the Pacific Surfliner) to be extended north of Los Angeles and to Santa Barbara, today there are five daily round-trips per day from Los Angeles (plus the Coast Startlight which does allow intermediate travel between Santa Barbara and L.A, it is also a smoke stop on that train) two of these are extended to San Luis Obispo, the other three terminate in the western suburb of Goleta (which before it opened in 1998, these trips terminated in Santa Barbara). This Santa Barbara station though serves as the transfer point for passengers from the three trains that terminate in Goleta to buses up to the Central Coast with some continuing to San Jose and the Bay Area. 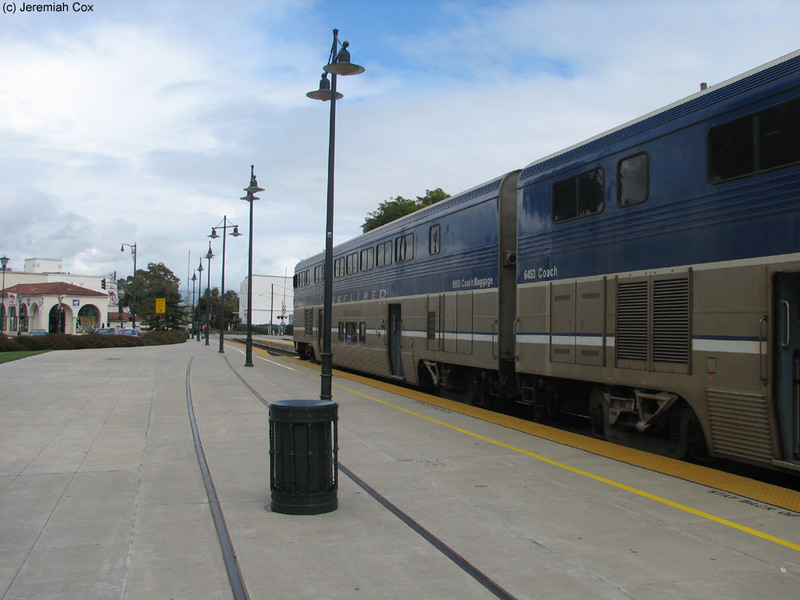 The stop is also the terminus of three daily round-trip buses to Bakersfield to connect with San Joaquins trains. 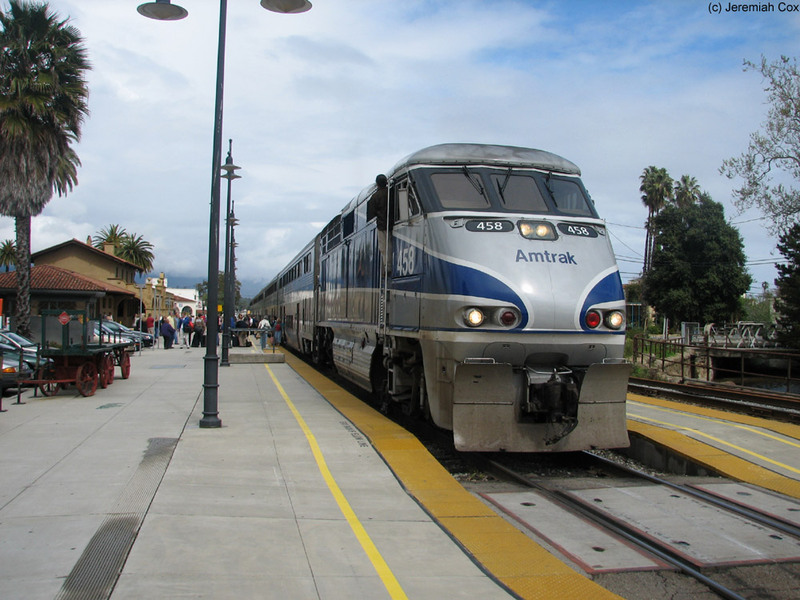 These buses follow the route of the Surfliner from Oxnard up to Santa Barbara stopping at the two intermediate stations. 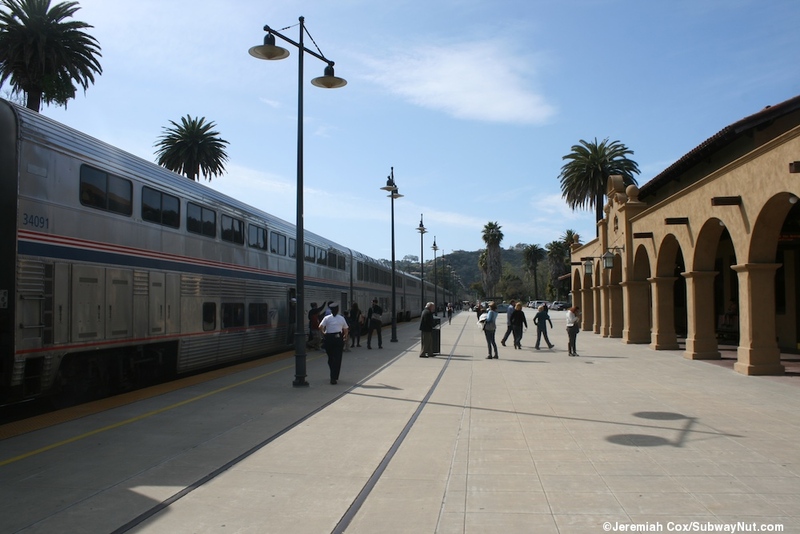 There is also one daily round-trip Amtrak thruway bus per day down to Los Angeles to provide an additional frequency (the northbound one terminates in Goleta). 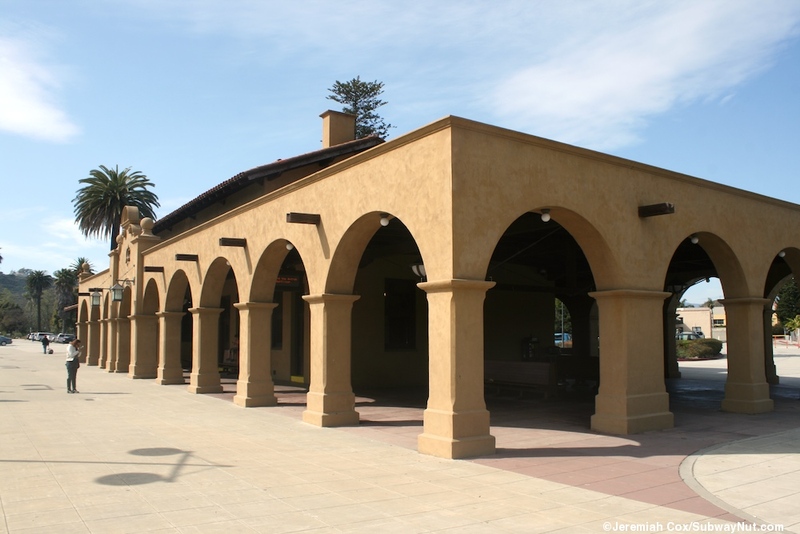 The station has a beautifully restored SP mission style depot built in 1905 and restored to its original grandeur in 1998-1999 (as a plaque dedicated December 1999 by Santa Barbara Parlor Car No. 116, suns of the Golden West and Reina Del Mar Parlor No. 126, daughters of the Golden West reads). 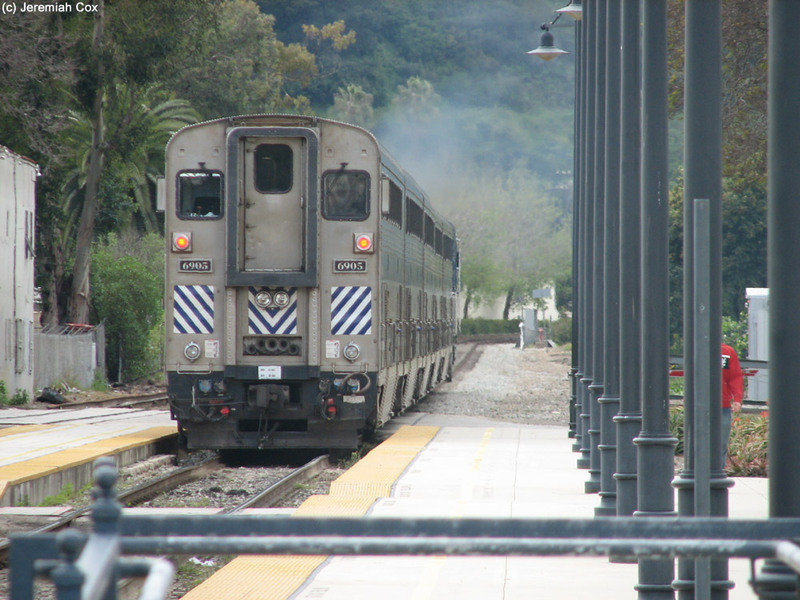 Two station is two blocks from the Beach and in Santa Barbara's downtown. 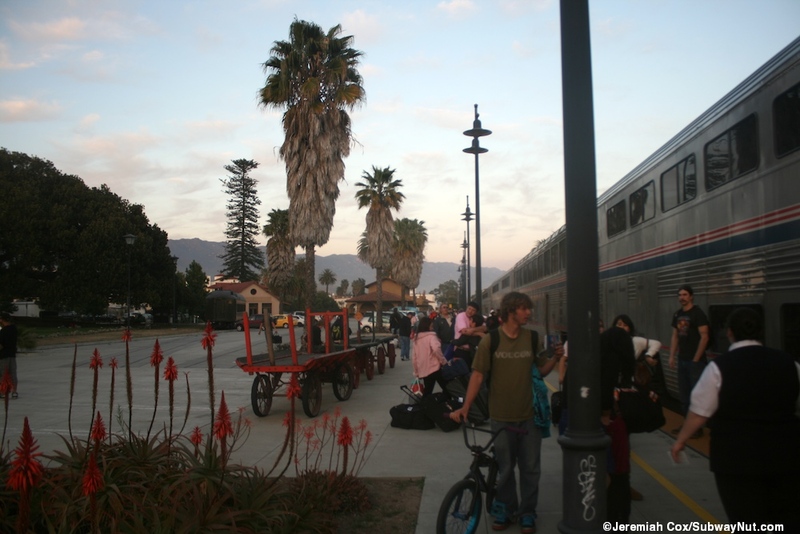 The depot has an expansively roof with eaves that cover a large outdoor waiting area (with two vintage wooden benches) just south of it and smaller outdoor sheltered areas along each of its walls (these are no supplemental shelters, these are enough). The entrance to these outdoor areas are all marked by a series of wide arches holding up the roofline. Beneath the eves the varnished wooden structure that holds up the roof is visible. 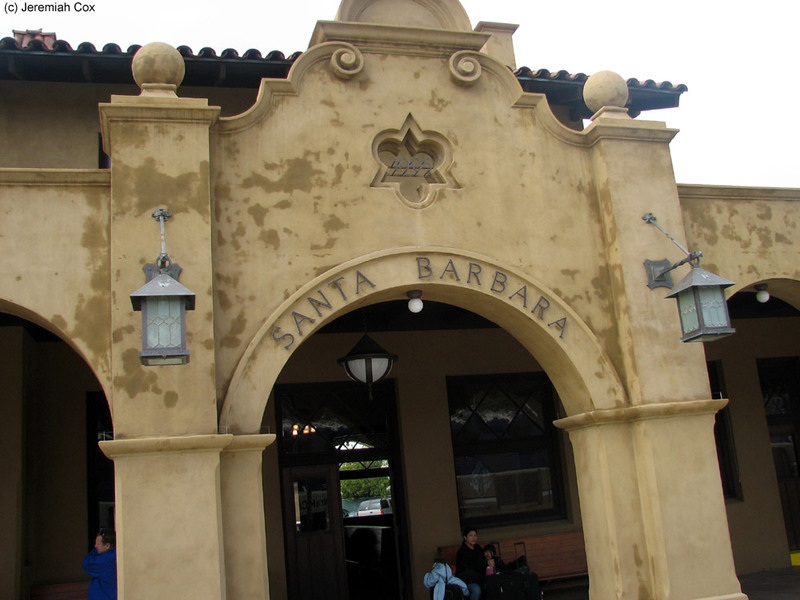 Lettering reading Santa Barbara on the side of these arches is the only item close to a name sign for the station. On the northern side of the depot outside beneath the roof is a Metrolink TVM in a wooden structure (surprisingly there is no Quick-Trak machine at the station). Inside the depot is a waiting area with wooden benches, orange tiled walls and the former granite fireplace, the mantel now used for brochures. The ticket office is in its own little separate area with wood paneling around the windows and can have up to three agents working the windows at once. Baggage check occurs at this same window and all stopping trains receive luggage service. The depot leads out to a wide platform with the concrete remains of a track, switching from the existing track still visible in the pavement. This low-level platform is along one track with tactile warning strips and there is a second very narrow island platform that serves the second track in this area with numerous little crossings connecting them. The surface of this narrow island platform (just for boarding trains, never for waiting) is more tactile warning strips than platform. 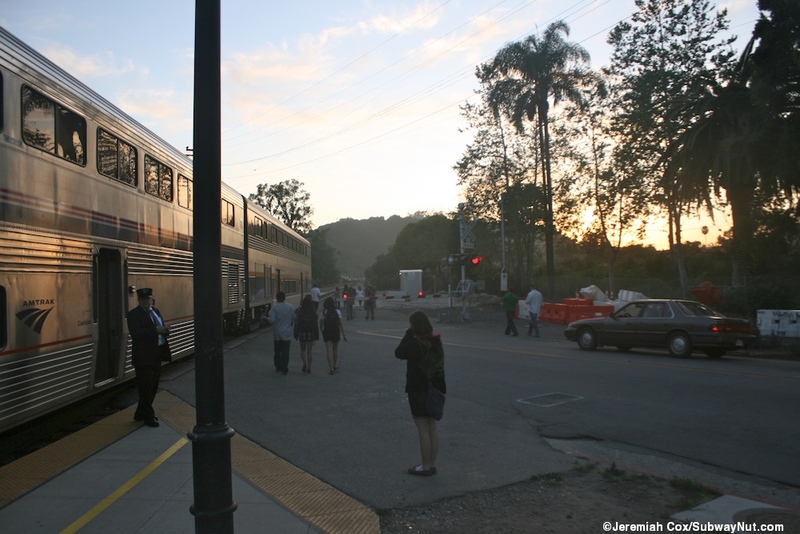 The platforms can accommodate about 12 cars (including locomotives) that is almost always long enough except when the Coast Starlight is deadheading cars (a routine occurrence since it is the one train between the fleets of Northern California and Southern) which may block one of the two grade crossings the station platforms are nestled between (with entrances from each street at their ends), Montecito Street and State Street. 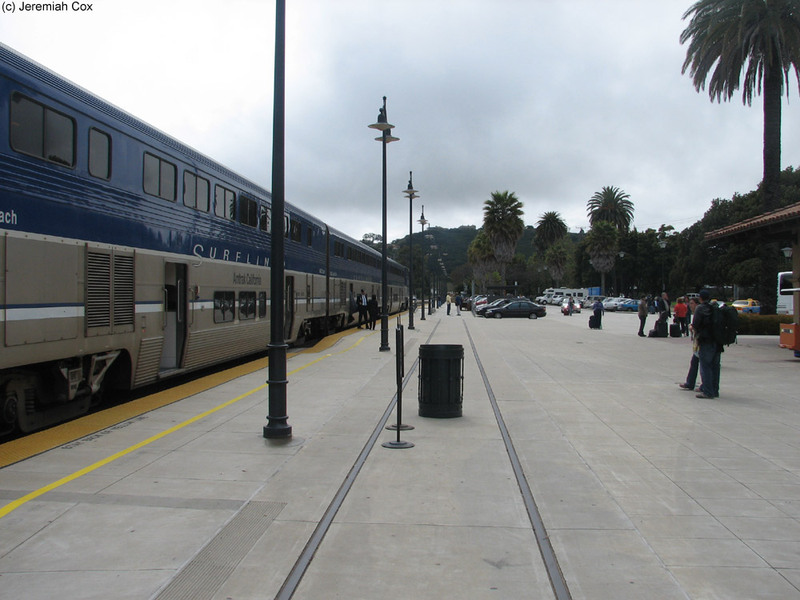 The main side platform has a line of black lampposts, and an unused concrete mini high level wheelchair ramp. Along the western half of the platform beyond the depot is a small parking lot (there is a little more north of the depot, Amtrak.com claims 100-150 spaces including some other lots) with concrete covering two train tracks. 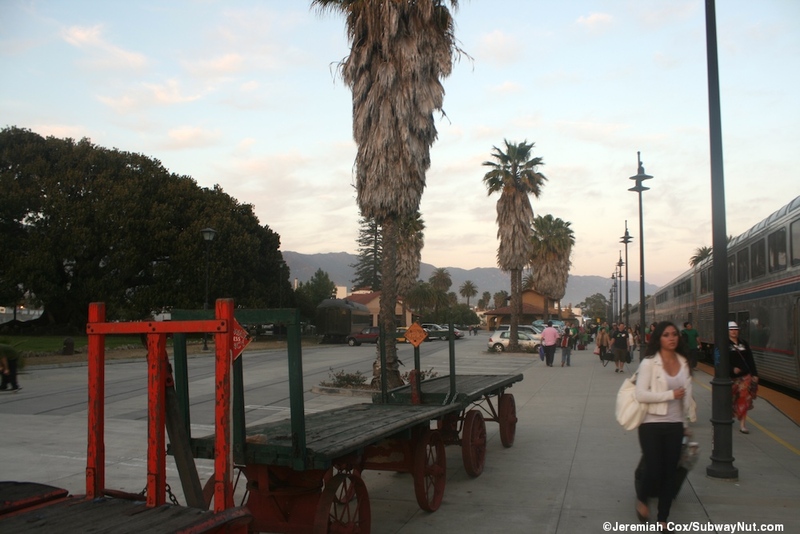 These are to represent the former sidings used by wealthy private car owners to park their cars when visiting Santa Barbara. Vintage SP 142 Parlor Car Santa Barbara is on display on the opposite side of this parking lot as a remembrance to these bygone days (a plaque says). 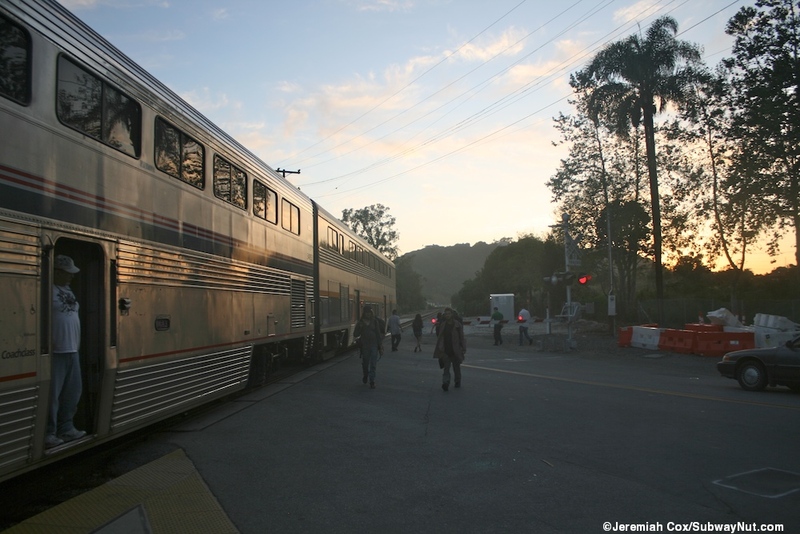 It is a former SP business car that was built in 1899 (my espee modelers Archive, California's Railroad to the US, Businessmen Car References, Link). North of the depot are just some more parking lots and east of it a landscaped plaza leads to State Street a major road to downtown. 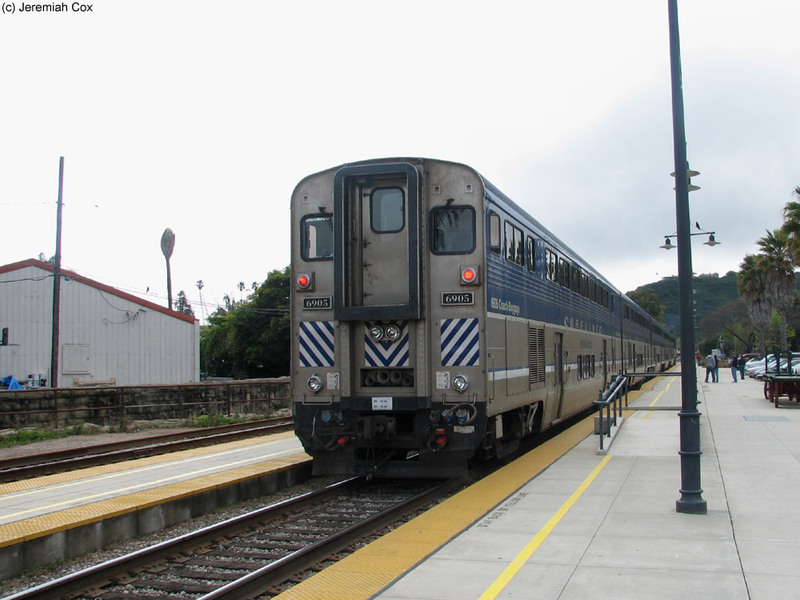 F59PHI #458 the power of Pacific Surfliner Train #769 bound for Goleta stopped at Santa Barbara, running on time. 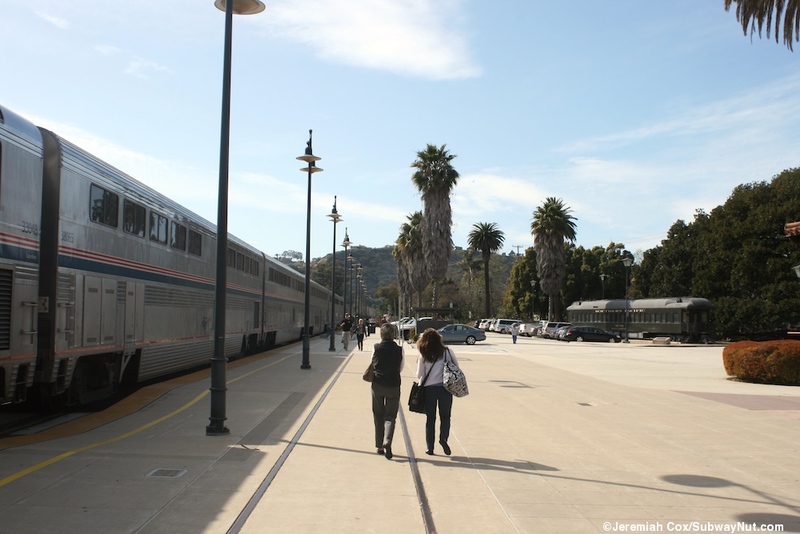 Looking down the wide platform at Santa Barbara by the line of tall lampposts and Pacific Buisness Class Car #6802 and Coach/Cafe Car #6305. 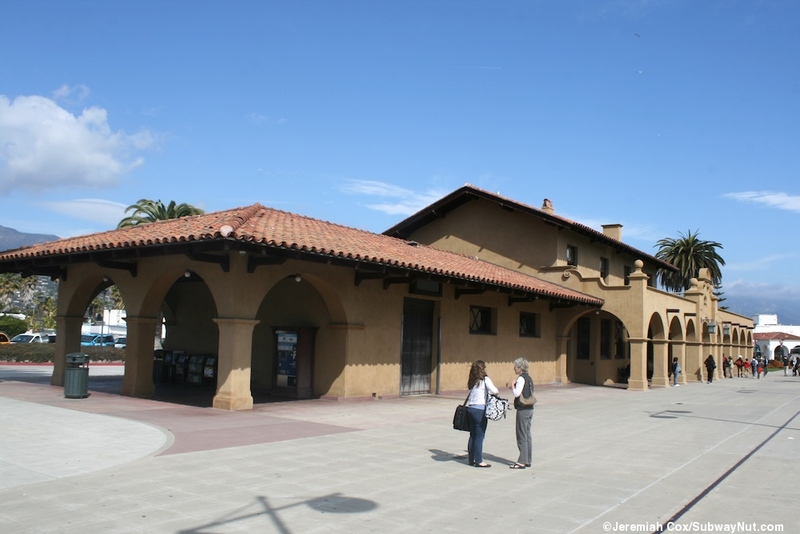 The large mission style station house at Santa Barbara. 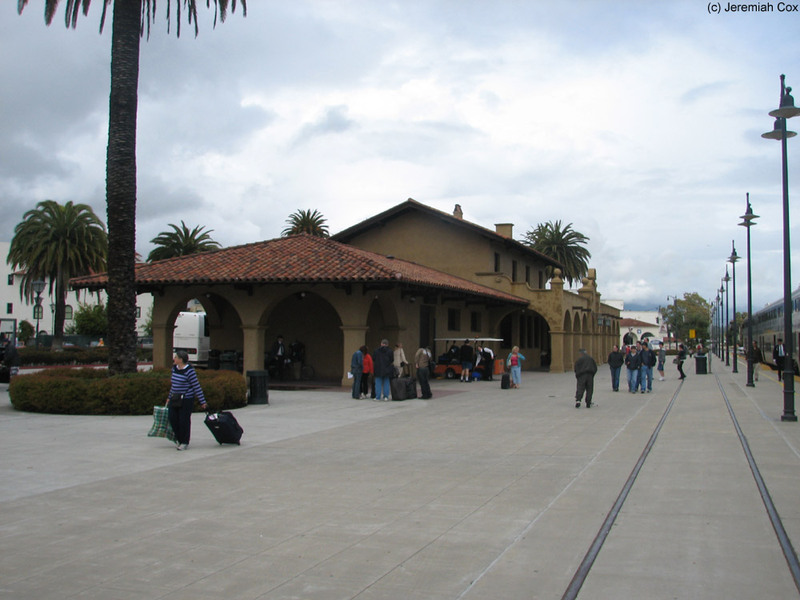 The main arch with the station name and lampposts at the main platform entrance from the station house at Santa Barbara. 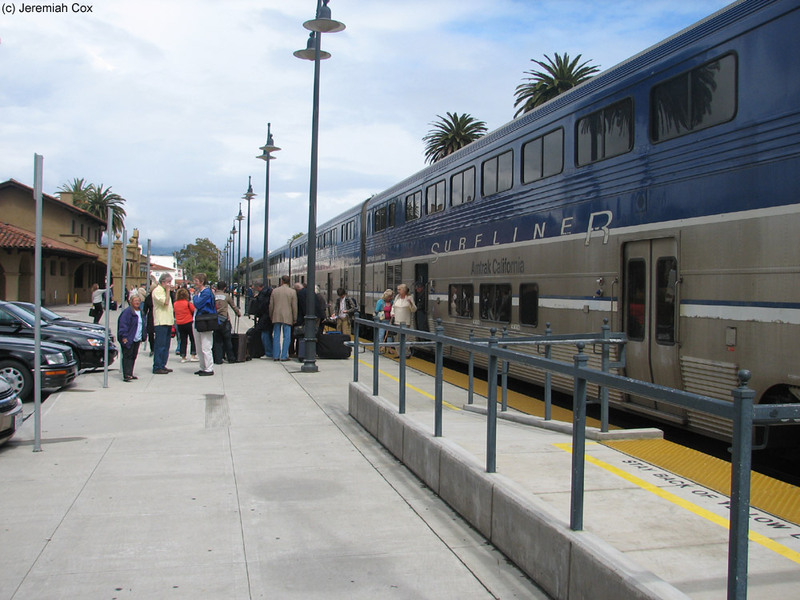 ooking down towards the end of the platform at Santa Barbara by Coach #6453 'Pacific Beach', and Coach/Baggage/Cab Car #6905 all on Sufliner train #769 bound for Goleta. 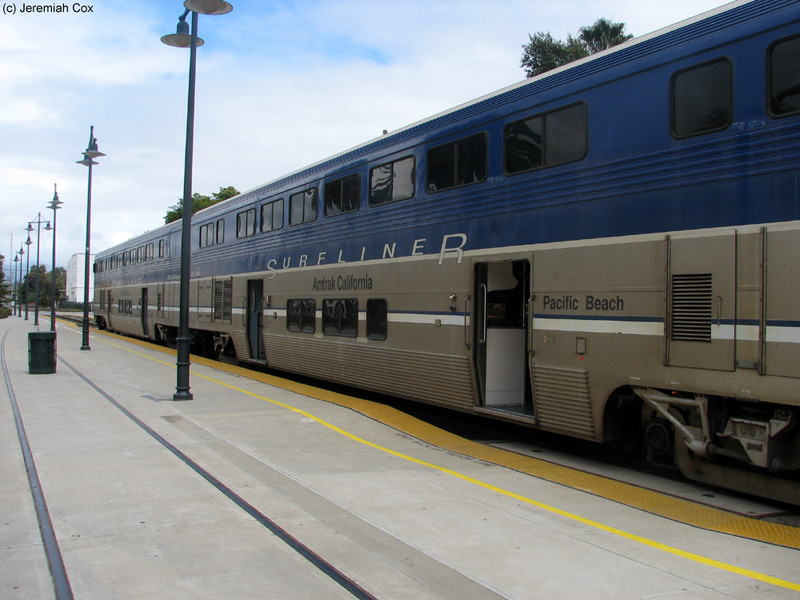 Sufliner Coach #6453 'Pacific Beach' at Santa Barbara. 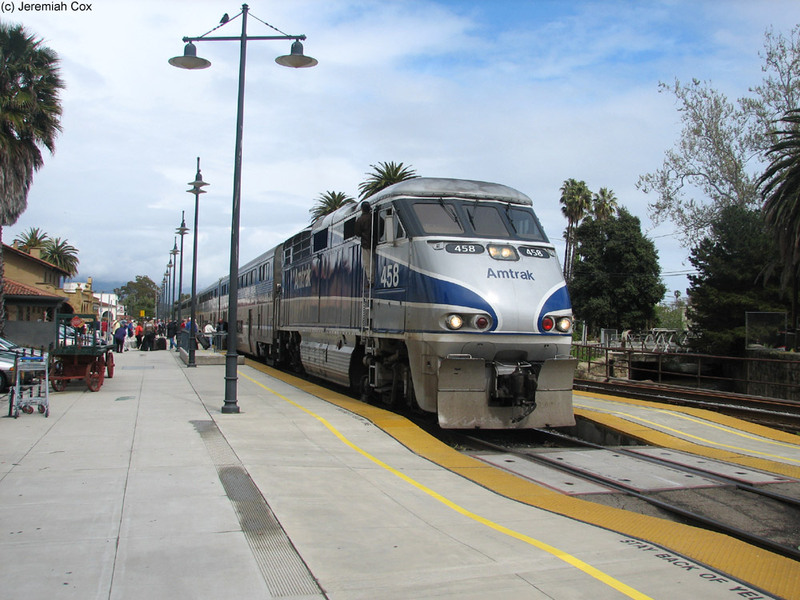 Surfliner Train #769 leaves Santa Barbara for its short finishing ride to Goleta with Coach/Baggage/Cab Car #6905 at its rear.